Articles are available for Download and personal use. These articles are from various sources. When available sources will be given credit where credit is due. If you have any articles of interest please submit them to us for review and posting. Please respect the copy writing of the materials. If you want to understand and reach today’s twentysomethings, then you need to study them. You can find a long list of resources, simply by typing the word “twentysomething” or “young adult” into amazon.com or google.com and seeing what pops up. Hundreds of titles, articles, movies, television shows, and songs describing the twentysomething years abound. We’ve put together a short list of recommend reading and viewing from both mainstream and Christian publishers as well as magazines, newspapers and websites which highlight trends, statistics and new developments. Remember that this list is only the beginning, but we all have to start somewhere. As far as mainstream books, Quirkyalone: A Manifesto for Uncompromising Romantics (Harper SanFrancisco, 2004) by Sasha Cagen explores that fact that there are thousands of people who are not only happy but actually embracing their singleness. While the book contains a few unusual and off-color ideas, the book is worth reading because it expresses the heartbeat of many singles. In fact, Quirkyalone has become its own movement of sorts. Check it out. In 2001, Ethan Watters published a thought-provoking article in the New York Times called “In My Tribe.” The article eventually became the basis for the book, Urban Tribes: A Generation Redefines Friendship, Family and Commitment (Bloomsbury 2003) which explores the phenomenon of urban tribes—or groups of friends who form a rich social fabric and become like family to each other. The title provides an insightful and informative look at the evolving social framework of our nation. Quarterlife Crisis: The Unique Challenges of Life in Your Twenties by Alexandra Robbins and Abby Wilner (Putnam/2001) examines the challenges unique to twentysomethings. The quarterlife crisis, a term the authors coined, is a lot like a midlife crisis, except that it happens 20 years earlier. It includes a time of overwhelming choices, instability, and unexpected responsibilities, which leaves many young adults with a sense of helplessness. This book is helpful in understanding what it means to be a twentysomething today. In some regards, Twentysomething: Surviving & Thriving in the Real World (W Publishing, 2004) by Margaret Feinberg is a Christian response to Quarterlife Crisis. It reminds twentysomethings that they’re not alone in their struggles. God is with them. Twentysomeone: Finding Yourself in a Decade of Transition (Waterbrook, 2003) by Craig Dunham and Doug Serven also examines the period of time between your teens and thirties from a Biblical perspective. While Twentysomething and Twentysomeone are specifically titled and targeted to reach twentysomethings, many Christian publishers are releasing new books designed to meet the felt needs of this generation including Girl Meets God: A Memoir (Random House , 2003) by Lauren F. Winner, Blue Like Jazz: Nonreligious Thoughts on Christian Spirituality by Donald Miller (Nelson, 2003) and Red Moon Rising: How 24-7 Prayer is Awakening a Generation by Pete Greig & Dave Roberts (Relevant, 2003) and Gen Ex: Adult Children of Divorce and the Healing of Our Pain by Jen Abbas (Waterbrook Press, 2004). This year look for a variety of new authors and books from publishing houses including Relevant Books, W Publishing, Baker Book House, Tyndale Publishing House, Regal Books, Waterbrook and Zondervan among others. If there’s one newspaper that you can’t afford to skip, it’s USA Today. The newspaper, which has discovered how to efficiently communicate the news in short, fun sound bites, has one section that you need to read anytime you have spare: The Life Section. The purple-colored Life Section highlights what’s hot in publishing, film, music and pop culture. So if you’re struggling to keep up with what’s popular in mainstream culture, just spend a few minutes thumbing through the Life Section of the USA Today. AARP Magazine and newsletter. It may seem strange to read about older Americans in order to understand the youth, but AARP Magazine is a treasure trove of information. Because many of the features focus on demographic changes and developments, writers tend to look at the differences between generations—thus providing rich insights into today’s twentysomethings. Youthspecialties.com—While Youth Specialties largely targets youth leaders, you can find all kinds of ideas and insights on teens—who are your up and coming twentysomethings. Their free, weekly Youth Specialty e-update includes a section on “News and Article Clips” which often contain bits of demographic data and trends among twentysomethings. Elevate2005.com—This series of conferences which seeks to become a more than a meeting, but a movement challenges young adults to merge faith and the workplace. Scan the online articles and materials. Encourage twentysomethings from your ministry to attend. They won’t be disappointed. Theooze.com— Designed as a website dedicated to emerging church culture, the site contains thought-provoking pieces from a variety of writers, most notably Spencer Burke. You’ll find introspective, honest and challenging articles written by those who are reaching (or hope to reach) young (and old) adults. Futuregen.org—Cook Communications Ministries organizes an annual conference which draws key Gen X and Gen Y pastors, leaders and experts from across the country. Don’t just read about it, consider attending with your key leaders. Relevantmagazine.com—Founded by Cameron Strang, the company which seeks to reach twentysomethings has both a magazine and book publishing division offering edgy titles and articles for young adults and their leaders. Rightnow.org—A great resource for teaching tidbits and video clips, the website is perfect for those considering serving in part-time or full-time missions. Other sites including emergentconvention.com, soulsurvivor.com, desparationonline.com, and jeninperative.com are worth searching, too. Don’t pretend your twentysomethings aren’t going to the movies, watching reality television, and watching MTV. You may not approve of what they’re watching, but you still need to be aware of what they’re taking in. When appropriate, use examples in your illustrations, stories, teaching and conversations. Watch late night television. Stay up late and spend a few evenings watching Leno, Letterman, and the like. Catch up on Conan. Watch The Daily Show with Jon Stewart. Stay up and watch the latest skits on Saturday Night Live. You will find some things you see disturbing and others disgusting, but if you’ll also discover a lot of redeeming material that can be used to communicate the Gospel more effectively. And if you catch yourself laughing out loud, don’t worry we won’t tell. Even if you can’t stand reality television, you need to watch a few episodes of “The Apprentice” on NBC. Even if you don’t learn anything from Donald Trump, you will still have some great connecting points with twentysomethings. Rent Garden State written and directed by Zach Braff (“Scrubs”). It’s described by some as “The Breakfast Club” of this generation. It’s a twentysomething coming of age kind of flic. Rent both of the “Bridget Jones Diaries” films in order to understand the irony of being single today. More women than you can imagine relate to her Bridget’s quirky character and the strange series of events portrayed. Margaret Feinberg (www.margaretfeinberg.com) is an author and speaker based in Sitka, Alaska. She’s author of Twentysomething: Surviving & Thriving in the Real World and How To Be A Grown-Up: 247 Lab-Tested Strategies to Conquer Your World. In addition, she’s written God Whispers: Learning To Hear His Voice, Simple Acts of Faith, Simple Acts of Friendship, Simple Prayers of Hope, Just Married: Surprises From the First Few Years of Marriage and way too many magazine articles. You can reach her at margaret@margaretfeinberg.com. 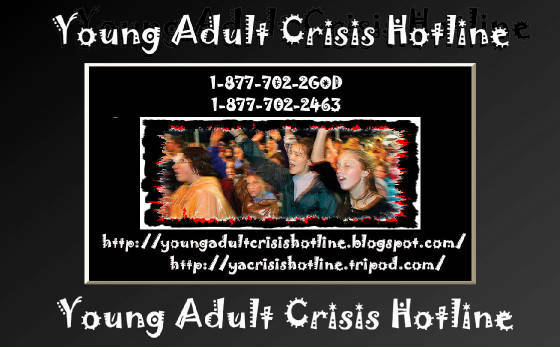 "The Young Adult Crisis Hotline offers immediate emotional support by telephone volunteers trained to help young adults who may be having relational problems, addictions, have a eating disorder, are suicidal, in emotional distress, or in need of reassurance. Services are free, confidential, and anonymous." The Young Adult Crisis Hotline and Biblical Counseling Center is available to offer encouragement to you in the midst of your crisis by Pastor Teddy Awad. Required Waiver and Release of Liability must be read and acknowledged at time of initial Crisis Hotline Correspondence(Press Here to read before you call). All contact information will be kept confidential and will not be shared for your own privacy. The Young Adult Crisis Hotline and Biblical Counseling Center are Affiliate with TOPEC (Total Personal Care Missions International, Inc.) an Internationally recognized nonprofit that is registered in New Jersey as a (501(c)3) with the Internal Revenue service with corporation number 0100490873 and can receive donations that are Tax-deductible to the Giver. Please refer to you accountant for further important information regarding your giving. Fear not, for I am with you; Be not dismayed, for I am your God. Unless otherwise noted all scriptures are from the New King James Version © 1982 Thomas Nelson, Inc. All rights reserved.